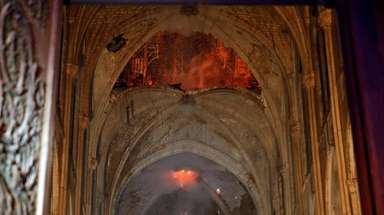 PARIS — A catastrophic fire engulfed the upper reaches of Paris’ soaring Notre Dame Cathedral on Monday as it was undergoing renovations, threatening one of the great architectural treasures of the Western world as tourists and Parisians looked on aghast from the streets below. 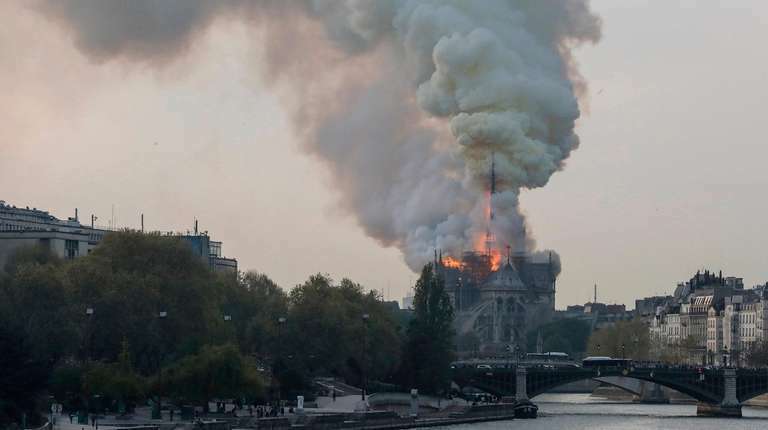 The exact cause of the blaze was not known, but French media quoted the Paris fire brigade as saying it was “potentially linked” to a $6.8 million renovation project on the church’s spire and its 250 tons of lead. The Paris prosecutor’s office ruled out arson and possible terror-related motives, saying it was treating it as an accident. Flames shot out of the roof behind the nave of the cathedral, among the most visited landmarks in the world. Hundreds of people lined up on bridges around the island that houses the church, watching in shock as acrid smoke rose in plumes. Speaking alongside junior Interior Minister Laurent Nunez late Monday, police chief Jean-Claude Gallet said “two thirds of the roofing has been ravaged.” Gallet said firefighters would keep working overnight to cool down the building. The fire came less than a week before Easter, amid Holy Week commemorations. As the cathedral burned, Parisians gathered to pray and sing hymns outside the church of Saint Julien Les Pauvres, across the river from Notre Dame, while the flames lit the sky behind them. President Emmanuel Macron was treating the fire as a national emergency, rushing to the scene and straight into meetings at the Paris police headquarters nearby. Paris Archbishop Michel Aupetit invited priests across France to ring church bells in a call for prayers for the beloved Paris cathedral. 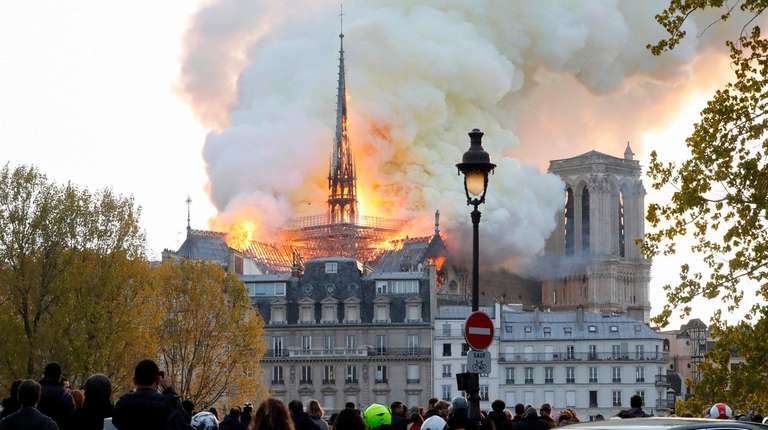 Deputy Mayor Emmanuel Grégoire said emergency services were trying to salvage the famed art pieces stored in the cathedral. Built in the 12th and 13th centuries, Notre Dame is the most famous of the Gothic cathedrals of the Middle Ages, as well as one of the most beloved structures in the world. Situated on the Île de la Cité, an island in the Seine river, it is famous for, among other things, its many gargoyles and its iconic flying buttresses. Among the most celebrated artworks inside are three stained-glass rose windows, placed high up on the west, north and south faces of the cathedral. Its priceless treasures include a Catholic relic, the crown of thorns, which is displayed only occasionally, including on Fridays during Lent. Long Island Catholic leaders spoke of pain and kinship as they prayed for the iconic cathedral, the emergency responders and the archbishop of Paris during Holy Week, which is a story of Jesus' death, followed by his resurrection on Easter Sunday. "We join in sorrow and prayer Archbishop Michel Aupetit and our Catholic brothers and sisters in Paris as we watch fire consume the great Notre-Dame Cathedral," Bishop John Oliver Barres, head of the Diocese of Rockville Centre, said in a statement. 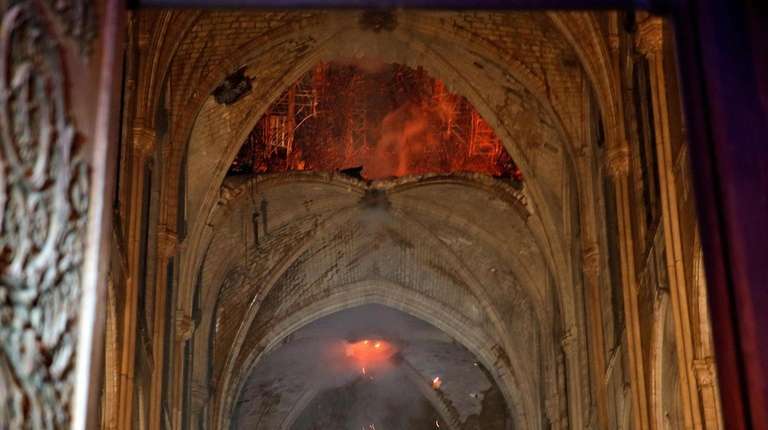 "While the Cathedral of Notre Dame is one of the great and most beautiful Cathedrals of the world steeped in history, our Catholic faith has and will continue to endure even the destruction of the physical structures where the faithful come to worship." Associated Press reporters saw massive plumes of yellow-brown smoke filling the air above the Cathedral and ash falling on the island that houses Notre Dame in the center of Paris. As the spire fell, the sky lit up orange. Mayor Anne Hidalgo said in a Twitter message that firefighters were still trying to limit the fire and urged Paris citizens to respect the security perimeter set up around the cathedral. 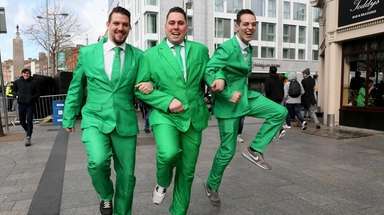 She said city authorities were in touch with the Paris diocese. In Washington, President Donald Trump tweeted: “So horrible to watch the massive fire at Notre Dame Cathedral in Paris” and suggested first responders use “flying water tankers” to put it out. MEASUREMENTS AND DESIGN: The interior of the cathedral is 427 feet by 157 feet. The main structure is 211 feet high. The three famed rose windows date to the 13th century. Notre Dame fire even more heartbreaking due to timingFor many in this largely Catholic country, especially for the most faithful, the medieval masterpiece is a sacred space that serves as the spiritual as well as the cultural heart of France. Editorial: A sense of loss at Notre DameThat the frightening fire broke out during Easter Week is cruel irony.